Former President Mohamed Nasheed, sentenced to 13 years in jail in a trial many observers have called a travesty of justice, has issued a statement wishing mercy on his jailers. “In this time of profound injustice, I harbour no hatred. And to those who seek to destroy me, I say: I wish upon you good grace and blessings,” the opposition leader said last night. Nasheed was convicted of ordering the January 2012 military detention of Criminal Court Chief Judge Abdulla Mohamed. The Criminal Court denied Nasheed bail on February 23 at a first hearing without legal representation. The three-judge panel at subsequent hearings dismissed Nasheed’s repeated requests for additional time to prepare a defence and refused to call the defence’s witnesses claiming they do not appear to negate the prosecution’s evidence. The three-judge panel also included two judges who had acted as witnesses in an earlier investigation into Judge Abdulla’s arrest. In his statement, Nasheed called for mass protests against President Abdulla Yameen’s regime and appealed to supporters to remain courageous and strong. 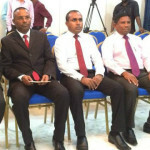 “The Maldivian judiciary is full of corruption and disgrace. Judges are routinely accepting the vile money of bribery. These judges have no fear of the day of judgment, and no shame in this world. The consequence of their actions is injustice to the public and the thwarting of this country’s development,” the former president said. Nasheed was the Maldives’ first democratically elected president. “Why am I calling for such a sacrifice? Know this for sure: it is not for my own well being . I am not staying in jail, a captive, because I have no way out. I could easily secure my freedom and happiness by agreeing to stop the work I am doing, and falling at President Yameen’s feet. I could choose to live in riches, in comfort, and in joy. But if I choose that path, Maldivians will reach a tragic end. Maldivians will be deprived of what they rightfully deserve: freedom, dignity and democracy. They will never be allowed to stand tall. Forever, they will be forced to cower before this dictatorial regime. Delivering the guilty verdict, Judge Abdulla Didi said the prosecution’s evidence proved beyond reasonable doubt that Nasheed as commander-in-chief ordered the arrest or “forceful abduction” of Judge Abdulla. When provided with the opportunity to present concluding statements at an initial hearing at 9:15pm, Nasheed once again asked for legal counsel and additional time. “My incarceration in Dhoonidhoo Jail prevents me from communicating with my lawyers. They are unable to provide me with the legal counsel I require. They were not provided with the prosecution’s evidence for review, adequate means for communication, or internet services. There were no arrangements for us to sit together to prepare legal documents,” he told the court. However, reading out the guilty verdict at 11:15pm, presiding Judge Abdulla Didi insisted Nasheed had been afforded adequate to prepare defence, arguing case documents had been provided three years ago when the former president was initially charged. Nasheed was first charged in 2012 with arbitrary detention under article 81 of the penal code, which carries either banishment or a jail term of up to three years. On February 15, Prosecutor General Muhthaz Muhsin withdrew the charges filed at the Hulhumalé Magistrate Court. Nasheed was arrested on February 22 shortly after the PG filed terrorism charges at the Criminal Court. Judge Didi also said Nasheed had refused to make use of a phone call to appoint new lawyers when all four of his lawyers quit. President’s Office Spokesperson Ibrahim Muaz Ali today said the government will ensure former President Mohamed Nasheed’s right to appeal his conviction on terrorism charges if he believes the Criminal Court did not follow due process. Looks like we are nation of cowards. Don't count on credible international pressure to free Nasheed. There won't be any action...only words. Gear up to live under autocratic rules for another at least 7 years. I wonder whether Nasheed had felt anything when he kidnapped the Judge and banished him an isolation for over 25 days without even giving excess to any one including his family and lawyers . Where was the judge rights ? I guess rights is only for Nasheed and no one else should experience any rights . Nasheed must decide the rights for everyone . I will never set foot in the Maldives again until the regime that rules it is no longer corrupt and observant of simple human rights. I will urge others to the same action. Its not a destination for backpackers. So don't you worry. If you want to feel of what its like, check out Sir Richard Branson's website. Where was "Hero" when his judge directly caused the deaths of Maldivian youths? Where are the rights of the families destroyed by his criminal actions? Shame on "Hero" to talk about 'rights'.